We got the front page! 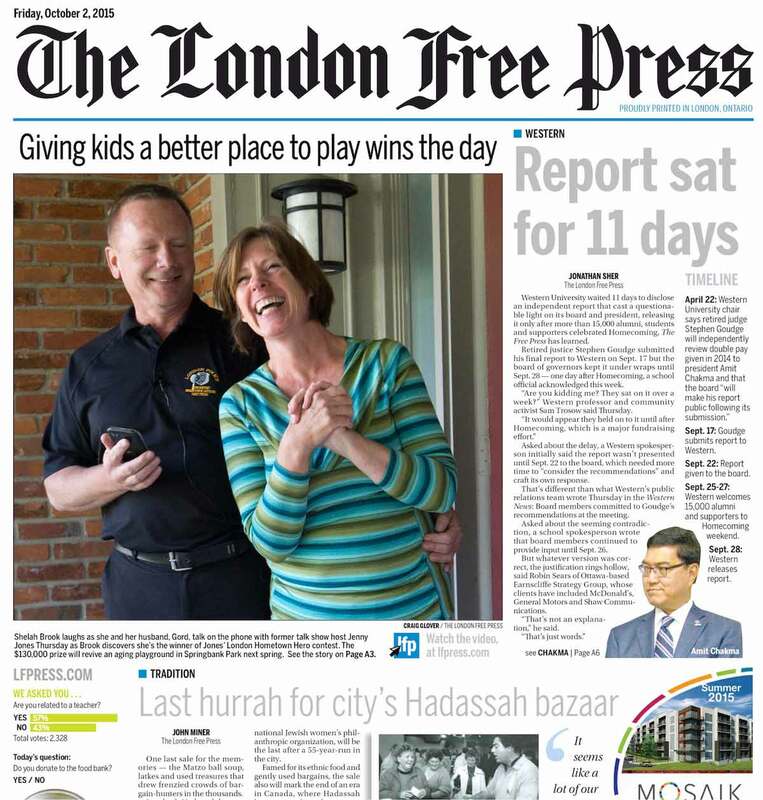 Shelah (and her handsome husband) made the front page of the London Free Press today! My sister was the first one to tell me, saying it was “above the fold” and that made it even bigger news! I called Shelah and she said neighbors have been coming by to congratulate her and that Gord is taking her out to dinner tonight to celebrate. What a guy! And he works for the police service! As it turns out, both Gord and Shelah are doing something great for the city. 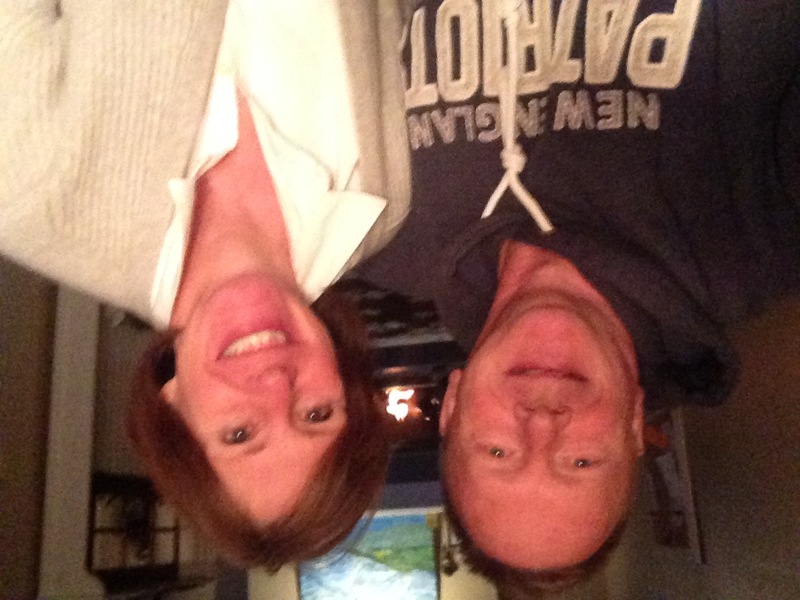 Here is a picture of Gord and Shelah celebrating! They chose to order in and be cozy!! 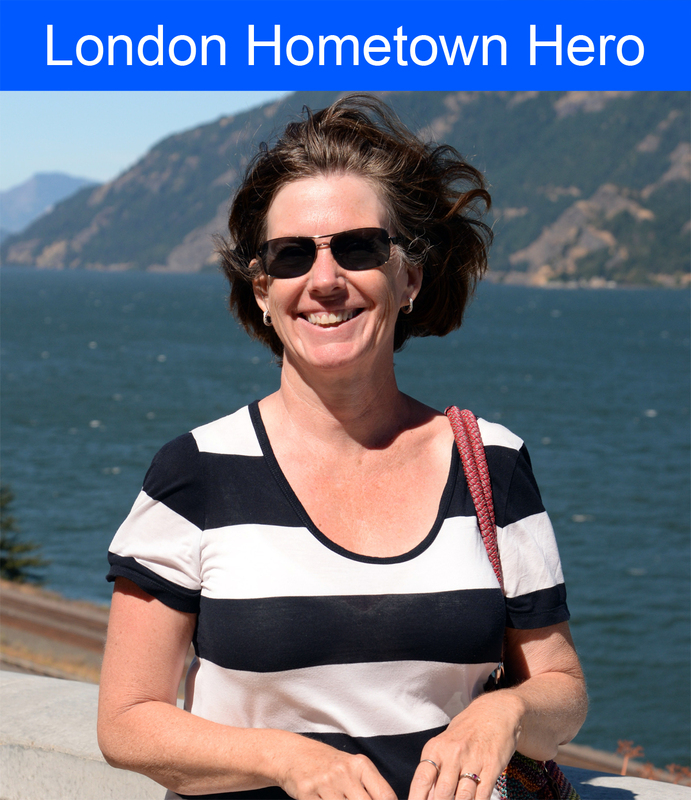 Congratulations to Shelah Brook, my final choice for London Hometown Hero! I just called to give her the news that her winning idea of a new, state-of-the-art playground in Springbank Park had been chosen and she was so excited… but then I am too. 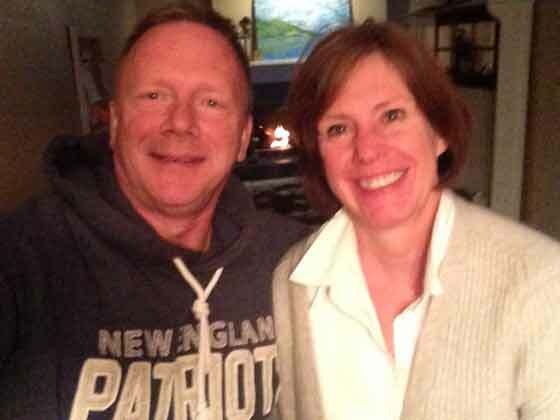 Her husband, Gord, helped set up my surprise call. In her application Shelah said, “Springbank Park has attracted visitors from all over the city for generations,” adding that a new playground would become the centerpiece attraction it should be. Shelah is a home daycare provider and pilates instructor and says she knows the importance of play for both children and adults. She requested $100,000 (which will be $130,000 CAD) for an accessible playground that will bring joy and fun to all children and their families. Shelah is a married mother of 5 adult children and her husband works for the City of London Police Service. They have lived in London for 30 years. This choice for a new playground satisfies many of the criteria I was looking for. I wanted something that could be enjoyed by as many people as possible and something long lasting. This certainly qualifies. I was also influenced by the large number of people who asked for playgrounds in various parks and schools. In fact, more requests came in for new playgrounds than anything else. I have already spoken to a London city planner and we will all be working together to design a fabulous new playground, which will likely be installed in the spring. It will be situated right where I used to play as a child on the swings and teeter-totter. Finally, I want to thank the hundreds of Londoners who submitted their ideas and I only wish I could have done much more. These are all people with big hearts who want to help their neighbors and their city and I encourage everyone to continue looking for ways to help the London community. The design progress and timeline of the new playground will be available here in my blog for anyone wanting to follow along. I hope to have some drawings and photos soon. Congratulations again, Shelah! To see the London Free Press feature, click here. To see the CTV News feature, click here.